The settlement at Bornais in the Western Isles of Scotland is one of the largest rural settlements known from the Norse period in Britain. It spans the period from the fifth to the fifteenth century AD when the Atlantic seaboard was subject to drastic changes. The islands were systematically ravaged by Viking raiders and then colonised by Norse settlers. In the following centuries the islanders were central to the emergence of the Kingdom of Man and the Isles, played a crucial role in the development of the Lordship of the Isles and were finally assimilated into the Kingdom of Scotland. This volume explores the stratigraphic sequence uncovered by the excavation of Bornais mounds 2 and 2A. The excavation of mound 2 revealed a sequence of high status buildings that span the Norse occupation of the settlement. One of these houses, constructed at the end of the eleventh century AD, was a well preserved bow-walled longhouse and the careful excavation and detailed recording of the floor layers has revealed a wealth of finds that provides invaluable insight into the activities taking place in this building. The final house in this sequence is very different in form and use, and clearly indicates the increasing Scottish influence on the region at the beginning of the thirteenth century. The excavation of mound 2A provides an insight into the less prestigious areas of the settlement and contributes a significant amount of evidence on the settlement economy. The area was initially cultivated before it became a settlement local and throughout its life a focus on agricultural activities, such as grain drying and processing, appears to have been important. In the thirteenth century the mound was occupied by a craftsman who produced composite combs, gaming pieces and simple tools. 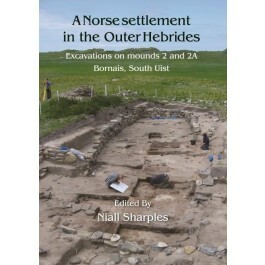 The evidence presented in this volume makes a major contribution to the understanding of Norse Scotland and the colonisation of the North Atlantic in a period of dramatic transformations.